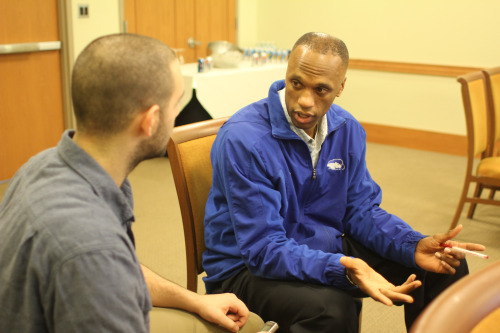 Current DePaul assistant Pat Sellers took the time to answer my questions on a variety of basketball topics. During my year as a graduate assistant at Hofstra, I had the pleasure of being able to work with and get to know Patrick Sellers. An assistant coach for the Pride at the time, he has since coached at Creighton and is currently an assistant at DePaul University. Coach Sellers was nice enough to take some time out of his day to talk to me about his move to DePaul, coaching in China, coaching Doug McDermott and way more. Coach Sass: You just moved over to DePaul, can you tell me why you made that move? Coach Sellers: Coach Leitao got the head job here and I’ve known Coach since I was about 18-years-old. He was the coach that recruited my brother [Rod Sellers] at UConn. He was an assistant at UConn, so we built a relationship in the recruiting process way back when. And then after, when I got into college, I worked at camps, so I was always working with him and seeing him on campus and talking to him and then it just kind of grew from there. So we’ve been friends almost 30 years probably, from our relationship at the start of my brother’s college career. And obviously Chicago’s a great city and I think DePaul has a lot of potential to be really good. Sass: That was my next question. DePaul hasn’t made the NCAA Tournament since the last time Coach Leitao was there. What makes you think it can be a sleeping giant? Sellers: I think just, number one, the city and DePaul, they’re dying, starving for a winner. You have a lot of interested people that are kind of looking. And then the last time they were good was when Coach Leitao was here. So that piques everyone’s interest recruiting wise and you have a lot of people reaching out or responding to us, so that’s been good. The other thing is we are getting a brand new arena. It’s going to be downtown. So instead of going to play 30 minutes out near the airport, now we are going to play in downtown Chicago, which is great, because now our fans will be able to get to the games. They can take the train there; take an Uber or a taxi or whatever, so it’s so much easier to get to the games. That’s going to be a huge, huge nugget for us in the future. Sass: You took a very different path than a lot of people, having spent two years coaching in China. What was that experience like? Sellers: China was really good. It was the pro level, so I got a chance to work around a lot of NBA guys. Everybody in China, most teams have a guy on the team or maybe two Americans, that are NBA-level or played in the NBA, played D-League or whatever, but really high level players, so I got a real good pro perspective. I learned a lot from the pros, just coaching those guys. Little tricks of the trade. I actually got a chance to work with Stephon Marbury for a few months and he was great. And then you could say, I got a chance to perfect my craft of coaching, because I did all the scouting reports. I was able to kind of tinker a little bit. I called a ton of college coaches and NBA coaches and asked them certain things on pick and rolls, and what do they do on defense and got a couple of offensive sets. So it was a really, really good experience for me and I enjoyed it. Sass: Speaking of China, I remember two-years ago or so, you texted me, and a couple of other guys that you had just seen Emmanuel Mudiay and he was the next Lebron. He spent the year in China and now he’s in the draft. Do you still feel that way about the kid? Sellers: Everybody sort of hasn’t seen him in a long time, when you don’t see him physically, so scouts over here or coaches or just fans in general, it kind of gives you an uneasy feeling. But from what I saw, when I saw him play AAU, I compared him to a 6’4” Lebron [James]. It was kind of like when I saw Jason Kidd, I said Jason Kidd was a 6’4” Magic [Johnson]. I think Mudiay has that same, 6’4” Lebron type of great body, phenomenal athlete, very good IQ. I think he has a chance to be a good player. Obviously playing in China, I think helps him, because he played NBA rules and learned from professionals. You learn to be a pro so you get a year of just playing professional basketball and that’s only going to help. Sass: Speaking of the NBA and younger guys, you coached Doug McDermott during his senior year at Creighton. Obviously he was incredibly successful there, but didn’t play a ton with the Bulls. Now with that coaching change, do you think Doug has a chance to still be a really good NBA player? Sellers: Yeah, I think Doug is just a special talent, a special offensive talent. He can score the basketball in a ton of different ways and I think the Bulls, with Thibs [former head coach Tom Thibodeau], he didn’t play rookies a lot, which a lot of coaches don’t do that. But that’s the thing. It kind of put Doug in the position to be a spot-up shooter and he’s a lot more gifted than just a stand-still shooter, because he can really put it on the floor, he can post up, he can drive and he can score in a lot of different ways with either hand. So he’s got a lot of ways to put the ball in the hoop. I think with Coach Hoiberg, who’s really close with the guys at Creighton and a good friend of mine, he has a really good feel for Doug. He’s known him and they went to the same high school. So I think he’s really going to give Doug a chance and an opportunity to get into the rotation and not only be a spot up shooter, but also be a scorer. Sass: You obviously saw him a lot more in college that I did, but he just did so many things. He could play out of the post and he was really versatile. I think you’re right. Eventually he’s going to be pretty good. Sellers: I think he’s got a chance. If you remember how David Lee was playing for the Knicks, Doug is not as big as David Lee, but when David Lee was on the Knicks he was scoring in the post, he was stepping out a little bit, he was putting on the floor. Doug can do those same things and he can even stretch the court, because he can shoot threes, so I think in that system, I think he’s going to flourish. If he can scratch out, say, 20-minutes-a-game next year, I think you’ll see some real good production from Doug. Sass: Earlier this year, I gave you a call and said that as a team we were looking to ICE/down ball screens. You took a ton of time to talk to me about it and it was something you did at UConn. Is that something you enjoy doing, talking basketball and helping young guys? Sellers: Yeah, I’m a basketball junkie, man. I love it at every level. I watch high school, college, pros. I just like looking at the way different coaches do different things and the reaction and the results from it. Watching the Finals right now, Cleveland and Golden State, you’ve got two opposite teams running an East Coast, smash mouth basketball and the other one’s a free-flowing, moving the ball, shooting threes, West Coast style team. So it’s been a fun matchup to look at. And then just looking at how guys defend certain things and you’re always trying to pick things up as a coach. And I’m always looking to share. I got that from when I started off at Central Connecticut, Coach Dickenman was a guy who was always willing to share whatever he had. We had clinics and had high school coaches come in. They would ask questions and Coach was always willing to help guys out, so I kind of took that mantra way back when, so I’m always willing to give whatever I have. Sass: You’ve kind of been all over the place as a coach. In the last 10 years or so, Connecticut, China, Hofstra, Omaha, Nebraska at Creighton and now Chicago. What advice do you have for a young coach like myself who’s seeing where you’ve been? Sellers: In 15 or 16 years of coaching, people see me, and they can see the love I have for the game. I don’t coach basketball for money or the TV. I coach it because I love basketball. And because that comes out and the way I handle myself, and the way I’m excited about it, I’ve been attracted to a lot of different places. I’ve gone to different places, because guys can see my love and that want me to give that on to the players, get the players excited about playing basketball and being a good student and getting a college degree. So the advice I’d give you is, go out there, work hard and really, if you’re doing it because you love it, good things are going to happen. Guys who go out and do it for money, sometimes the money can come and sometimes it doesn’t, but players can read through it when you’re doing it for money. When you’re doing it for love, you get the reward and I think that’s what I’ve always had, what I’ve always done and I try to pass on to the young guys. Sass: Give me your breakdown on the rest of the NBA Finals. Do you think LeBron’s got enough to carry the Cavs through? Sellers: You know me, I’m a big LeBron guy, so I picked the Cavs in six before the series and I’m still sticking with them. Matthew Dellavedova, all through the playoffs, he’s been an irritant on defense, really working hard and he’s done a great job on Steph Curry. If he can continue that, and I know he’s getting worn down because he’s playing so many minutes, but if he can continue to take Steph Curry out of the game, I think the Cavs can win this. He’s cutting the head of the snake off. If you’ve got Steph out, it’s not as free flowing, moving the ball and getting those threes up. But if [Curry] gets going, then they could be in trouble, because he makes those guys go, the other guys start making shots and threes and opening the floor when he’s going. And obviously LeBron has been tremendous. He’s controlling the tempo and he’s got it at a pace where they can play and stay within the game. I’ve got the Cavs in six. I’ve got them winning tomorrow night and then coming back home and finishing it up in six. This entry was posted on June 10, 2015 by Coach Sass in Coaching, College Basketball, The Presser (Interviews).